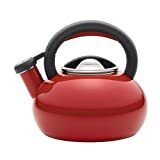 If you are planning to move in your own place and want to buy some kitchen wares then knowing the difference between a teapot, teapot warmer, and electric kettle can help you a lot. Tea is an essential part of our lives, and many of us usually end up taking several cups in a day. Teapot, kettle, and teapot warmers are the usual kitchen wares that we need in our kitchen and knowing the difference makes us more aware of how to make better use of them. 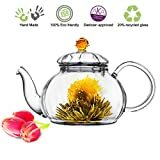 A teapot, electric kettle, and a teapot warmer, all belong to tea making and serving, yet they all have a different purpose, usage, and benefits. This article is designed to shed some light on each of them, and we will recommend the best option for each product as well. A teapot is a container used for brewing tea. Boiling or near boiling water and loose leaves of tea are added in it and are left for brewing for some time. Here it is important to understand that a teapot is not for boiling water, you are not supposed to put that on a stove for heating water. That’s what kettles are for. Due to its delicate texture, design, and material, teapots should not be put on a stove. You can pour warm or boiling water in a teapot and then leave it for brewing tea with loose leaves. A teapot usually has an opening with lid, from where you add water and loose tea leaves, a spout for pouring tea, and a handle for carrying the pot and pouring tea. Many of us love to brew tea from loose leaves due to its strong flavor. Tea bags do not make tea strong enough and fail to extract the true flavor of the tea. For those who prefer to brew tea from loose leaves, a teapot usually comes with a strainer that is fixed right on the inner edge of the spout. Teapots are made from different materials like porcelain, ceramic, stone, stainless steel, and even wood. As teapots are used to serve tea for guests, many elegant and delicate designs are available in the market that are chosen according to need, preference, and budget. 3. Durable glass can bear temperature shocks. 4. Microwave and dishwasher safe. 5. Secure and cool handle. 1. Glass design needs more cleaning and care for keeping in pristine condition. A kettle is used for heating water for tea, coffee, or other beverages. So the basic difference is that it is not for brewing the tea, but for heating water. Kettles can be stovetop or electric ones. Both have their advantages and customers depending on personal preferences use both. Stovetop kettle is a more affordable one than electric ones. You can place it on any induction, electric or gas stove. It works in all conditions and doesn’t mere depend on electricity. It may take more time in heating water and also is not as energy efficient as an electric kettle. Stovetop kettles are available in different materials like stainless steel, iron, ceramic, aluminum, or even glass. A wide range of kettles are available in the market, but if we have to choose one, then nothing can beat the Circulon 1.5-Quart Sunrise Teakettle. The kettle is built with the high-quality steel and is durable. The bright enamel exterior resists dents and scratches. Kettle is easy to clean and free of any harmful coating inside. It makes a pleasant whistling sound when water reaches boiling point. Its lid fits tightly and a squeeze and pours spout lever is incorporated right into the handle. The kettle looks great while resting on your stove and has a modern design with durable construction. Elegant design and can easily blend in any interior. Capable of making six cups of tea at a time. It is made of high-quality steel. Pleasantly whistles when water is boiling. A secure and stay cool handle. An electric kettle uses electricity to heat water. These kettles have powerful wattage that brings water to boiling point in no time. It works fast than the stovetop kettles. These kettles have a heating element in the base and a container for water. Besides being quick, electric kettles are more energy efficient and do not spike up your electricity bills. Electric kettles are coming with a lot of conveniences. They offer accurate temperature control, and you can heat water to the exact temperature as you want. 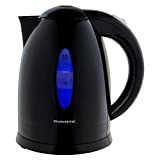 Many other useful features like auto shutoff, filter for hard water or keep warm options make these kettles convenient. Due to these advantages, electric kettles are more preferred. This electric kettle by Ovente is the best electric kettle due to the five thousand positive reviews of the customers. The kettle has a plastic exterior that is BPA free and gives a cool exterior even when water is boiling inside. None of the plastic touches the hot water as the interior is made of high-quality stainless steel. 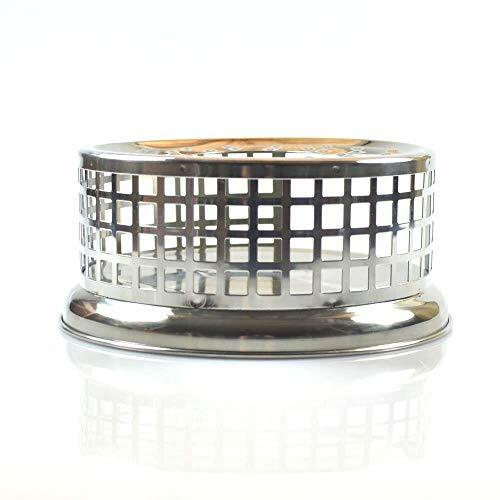 The heating element of the kettle is concealed in the bottom of kettle which prolongs its life as an exposed heating element deteriorates fast. The kettle comes with an auto shutoff system and boils dry protection technology to prevent accidents. The kettle also features a removable and cleanable filter and gives the best taste of your drink. The kettle is available in six exciting colors. 1. 1.7-liter capacity and can cater to the need of a large family. 4. Auto shutoff and boil dry protection. 6. Removable and cleanable filter. 1. Does not has variable temperatures. A teapot warmer is used for keeping the tea warm in a teapot. The teapot is placed on the tea warmer. Teapot usually has a candle inside to lit for keeping the tea warm. Many kinds of tea warmers are available in the market. 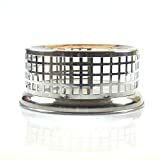 Some have a stainless steel construction with a brass finish to make it look appealing. Other materials like iron are also used for making teapot warmers. These teapot warmers come at a very affordable price and provide a great value for the money. It keeps your tea warm for a long time, and you don’t have to rush to the kitchen for brewing another cup while working. This candlelit teapot warmer by Yeme looks elegant and functions well. It is a premium quality teapot warmer that is elegantly designed for kettles and teapots. The teapot warmer is large and sturdy and is suitable for all types of kettles and teapots. Its metal design is durable and at the same time eye-catching enough to be placed in your drawing rooms, living rooms, offices, or workplace. Simply light the candle inside, and it will keep your tea or coffee fresh for a long time. 1. Metal design is durable. 2. Looks elegant and eye-catching. 3. Large and sturdy enough for all types of kettles or candles. 1. A bit pricey as compared to other teapot warmers. Premium quality warmer for teapots and tea kettles. Large sized, sturdy warmer will work with mid to larger sized teapots.